Our university is in an advantageous position. As I told the faculty and staff at the beginning of the academic year, American public higher education is at a crossroads. Institutions across the country are under fire for not delivering the very best return on investment, yet all are suffering from a lack of support and investment themselves from their traditional sources. Many of those institutions are tripping up on new fads and finding it difficult to find focus and concentrate on the things they do best and on the things that will serve students best. As I told the faculty and staff back in August, we must face the realities of our time and redesign the way we do our business. I also told them we cannot let go of the things we know we do well—providing those eye-opening experiences to the first-generation college student, being the place where students make lifelong connections, and providing the motivation or inspiration to try new things. 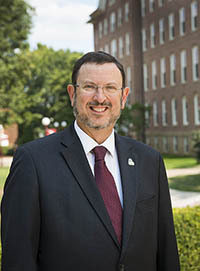 Over the last several years, you may have read in IUP Magazine articles about how the university community came together to confer and reach agreement on a shared vision for our future and then about our new strategic plan. The vision and the plan are our destiny. In both of these documents, we have committed to ensuring that all students will participate in intentional and interconnected learning experiences in their studies, in their lives, and in the world; that we will engage students in carefully designed open-ended, hands-on experiences to reinforce and enrich what they learn in the classroom; and that we will demonstrate an excellent return on educational investment, whether it’s the student’s investment, the commonwealth’s, or yours. Among the most exciting components of the plan are new programs in environmental engineering, public health, and digital science and security—programs we know will answer burgeoning societal needs as well as provide students with programs they want and deserve. With the strategic plan, we have a vigorous roadmap for accountability to ensure we do not fail. We have a faculty and staff who all want the same thing—and they share those aspirations with many alumni who have expressed agreement and endorsed our plans. Members of the IUP Leadership Society are a key force in IUP’s future. Your influence and your investment lift our university up so that our faculty, staff, and students can reach for and grab onto that proverbial brass ring. I encourage you to follow the links I’ve provided in this message, read over some of the materials, and leave a comment. After all, this is your university, too.